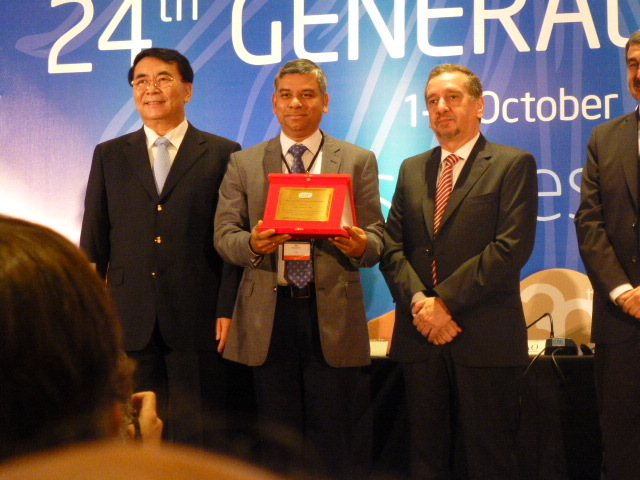 Kalyanmoy Deb (center), with (left) Mr. Bai Chunli, President of TWAS and President of Chinese Academy of Sciences, and (right) Mr. Lino Barañao, Argentinian Minister of Science, Technology and Innovation. Prof. Deb has been working on evolutionary computation since 1987. He has recently moved to Michigan State University from Indian Institute of Technology Kanpur, India. His NSGA-II algorithm — an evolutionary based multi-criterion optimization method — is a highly-cited work with more than 4,200 Web of Science citations alone and has been adopted by a number of commercial software companies. His newly established Computational Optimization and Innovation (COIN) Laboratory at MSU plans to promote research and application in this area by collaborating with academia and industries. More information about Prof. Deb’s research on evolutionary optimization can be found on his website. This entry was posted in BEACON in the News and tagged awards, Engineering, evolutionary algorithms. Bookmark the permalink.